A day in Namibia’s capital city! We woke up this morning in our cute little two person tents (good thing we did this as it’s a prelude to our full on camping trip that we do later) to the sounds of people in the next campsite over packing up their bags…it was five in the morning! Needless to say we weren’t so thrilled at the hour; but we got up, rolled up the sleeping mats and Mathew and Karel packed up the actual tent as I finished getting ready as I had packed up everything inside the tent. We stopped in the same two spots in the same two towns as we did on the way in to Etosha; the bakery for some snacks and internet time, Ot;iwarongo for a toilet stop and then we were on our way to Windhoek, Namibia’s capital city. And of course we remembered to take our malaria pills as we were up to the part of the trip that we were now taking them every day as we had started just before Etosha. We finally arrived in Windhoek in the afternoon, dropped our stuff in our new clean room decorated all in white and complete with air conditioning and a refrigerator and got some news. Paul told us that there were some complications with the travel of those meeting up with us in Windhoek so we would be leaving a bit later in the morning tomorrow than already thought…we were thrilled! We decided it was time for a bit of a late lunch and headed out to the shopping mall across the road for a quick wander and some food. There was a club rugby match on that Mathew wanted to watch so we were looking for a place to do that and came across a place for lunch, Mugg and Beans which is a chain restaurant almost like Applebee’s I would think. We had some lunch with Lee and then headed back to the hotel for a rest and a shower before dinner. Mathew and Lee went out for a journey around Windhoek as I stayed in for a bit of a rest. Winhoek itself is not a very safe city and doesn’t have that much to offer; think of spending a weekend in Albany if you weren’t visiting the school or having anything to do with politics. They trundled along finding that our hotel was situated at the end of Robert Mugabe Avenue (oddly enough) and saw a few other museums and buildings. After a rest and a shower we found ourselves heading to dinner at Joe’s Beerhaus. Ask anyone who’s been to Windhoek and this is where they’d tell you to go…there’s sand on the floor, ‘jaegermeister is their house beer’, game is a specialty and the décor is filled with what would be other people’s junk but the treasure’s of Joe. We got to meet two of the four people joining us on the next leg of this journey all the way to Victoria Falls, Zambia. Maria and Bernardo, both Portugese were just here for the nine days of this part. Maria is a neurosurgery resident in Portugal and Bernardo is a PHD candidate in Biology living in London and working for Cancer Research and only has his thesis to defend left in the program. Dinner was good and conversation flowed, but it was a bit hard for me as there was game all around. I was so glad that Eveline and I wound up sitting across from each other so at least there was another vegetarian dish to look at across the way. 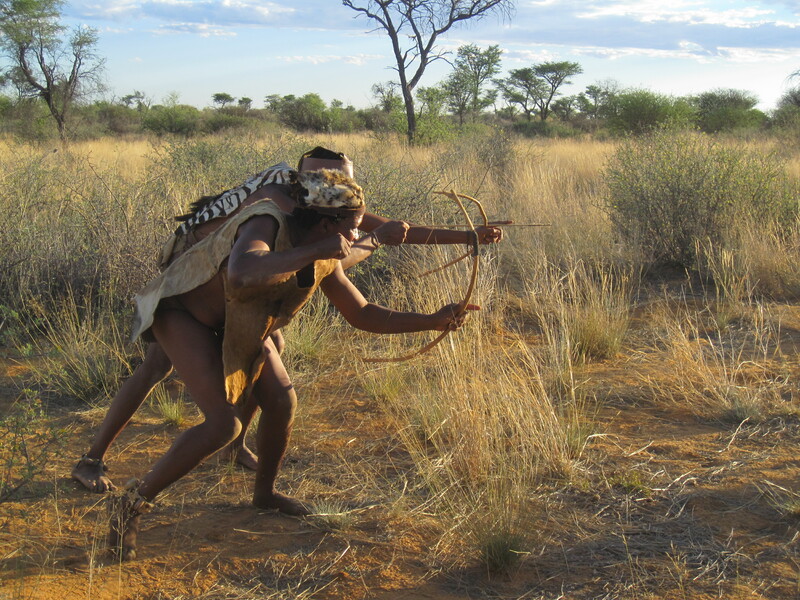 There was game all around the table…Kudu, crocodile, buffalo and even zebra…people said it tasted like horse…YUCK! Anyway, dinner was fun and we really liked our new members. Upon our return we found out that the other couple had already landed and we would have been able to leave on time in the morning but Paul decided to let us have a lie in. Ian and Louise would be joining us in the morning. We gave some goodbye hugs to Christine, Carsten and Lee who would all be leaving us in the morning; Christine and Lee to fly home and Carsten, who worked for BMW, would be joining a mate and continuing a journey through Namibia on motorbike. We made our goodbyes and then headed to bed. Tomorrow: Our last day in Namibia; home of the red sand! We awoke this morning to fresh air and a gorgeous African sunrise that reminded me of the clear night sky last night with all of the stars and how I might really enjoy going camping more often-especially if it all comes with ablution boxes of their showers and loo facilities and the scullery. The time was 5am and it was a bit chilly outside. We got changed in our tent and got washed up in the nearby ablution box. We had some oatmeal and peanut butter and some tea/coffee for breakfast and were on our way. 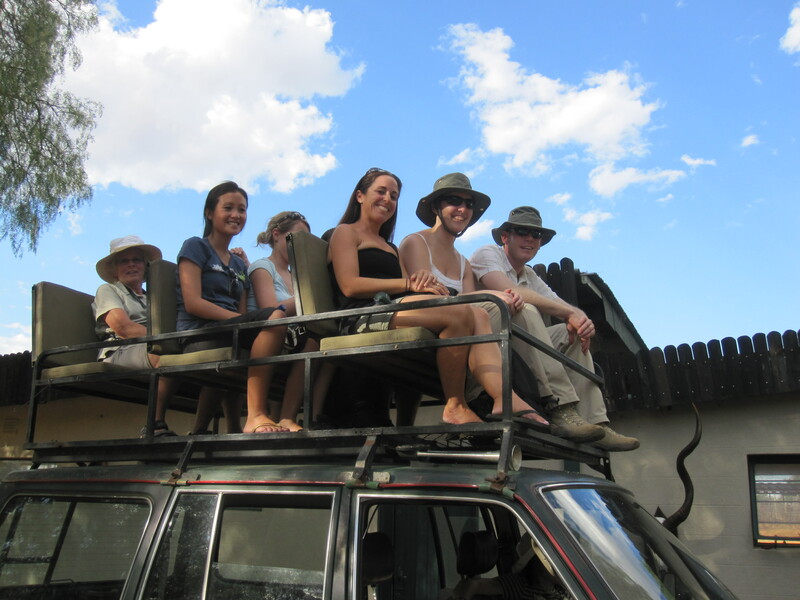 Where you ask…well, we had decided to go on an all day game drive with an outside contractor to Etosha National Park. The park only offered morning, afternoon or night drives and this one was basically all inclusive although you didn’t get the nighttime; but, we had been told many times to do the night one in Kruger National Park in South Africa, so we chose this one. This game drive would leave at 6:30 in the morning, come back for the heat of the day when the animals and people were all having a bit of a rest and then leave again for the afternoon portion around 3 and was to return around 6pm. Some of the others went on a night drive last night while others went on an even earlier game drive than us this morning and were planning on a night one as well tonight; but this was the one that Paul recommended, so this is the one we chose. The outside contractor running the tour picked us up in a huge open air 4×4 vehicle and we spent the next five plus hours going from water hole to water hole looking for animals and boy did we find them! We saw giraffe, oryx, springbok, wildabeasts, zebra, other types of antelope, elephants, a lion and much more. Yup, a lion! It was constantly amazing driving through the park (which was apparently the same size as the entire city of Barcelona) seeing so much wildlife. It was kilometers and kilometers in between each water hole and the drive at times seemed endless. But then, each time we approached a bit of wildlife our eyes opened wide and we were like little kids seeing Mickey Mouse for the first time. We even saw a giraffe lying down (which is quite rare) and older animals with babies such as ostrich, giraffe, wardhogs and springboks on their little wobbly legs getting ready to jump like their parents. It was just amazing! ELEPHANTS & ZEBRAS & GIRAFFE…OH MY! We woke up this morning, after a night of great air conditioning, to our friendly duck, flamingo family and ostrich right outside of our back door and after saying goodbye to them we went to the lodge for a beautiful breakfast. We made a few stops for groceries for the park as Paul was going to barbecue tonight and none of the meals were included for the next two days so we were on our own. There was going to be a small pool bar and a full restaurant, but if we didn’t want to pay for those then we had to pick up whatever we needed for meals. One more stop, and this one was for the picture books, that’s for sure. We could only imagine our friend William and how many amazing shots he would have been able to get had he been on this journey with us. And it was only polite to put a little money in their baskets if you wished to photograph them as again, you must ask adults out of respect for their beliefs if you can or cannot take their photo. It was at a Himba tribal craft market. The Himba, if you don’t know, are the most photographed people of Africa. The skin of the women is a reddish tint from a mixture of red sand and goat’s fat. After puberty hits (we were told), women no longer wash with water at all and men only wash once a month. The women cover themselves in this reddish mixture before they go out. They were very little clothing (as all of the women we saw had their breasts revealed) and Paul said that if you go to their village you can barter for their crafts with food supplies as they have very little. We left the Himbas and drove straight to Etosha National Park and an instant game drive as you enter the park where they have elephants, rhinos, lions, meerkats, wardhogs, wildabeasts, giraffe, zebra, springbok, stenbok, oryx and tons of other animals and we saw our first Etosha giraffe! Now, apparently there were nice air conditioned chalets that you could upgrade to, but we didn’t. So, we pitched our tents at the campsite which was right next to the ablution box (bathrooms and showers) and a short distance from the scullery (cooking facility) with lights and outlets and sinks. This was our first foray into ‘the tent’ which we were hoping would be good practice and a good experience as after this trip ends we have another nine day journey that is fully camping. These are two person tents; the ones that you have poles that fit into each other; pull up in the center to form a cross structure and the sides of the tent get pulled up to meet the poles. There are mosquito netted windows and a zippered door all with flaps that can zip down to keep out the rain. It wasn’t too difficult to put up which was a good sign. Paul and Karel set up the barbecue (to which I of course brought marshmallows) and the rest of went to hang by the pool. There were three round pools, a snack bar, a bar and a restaurant. 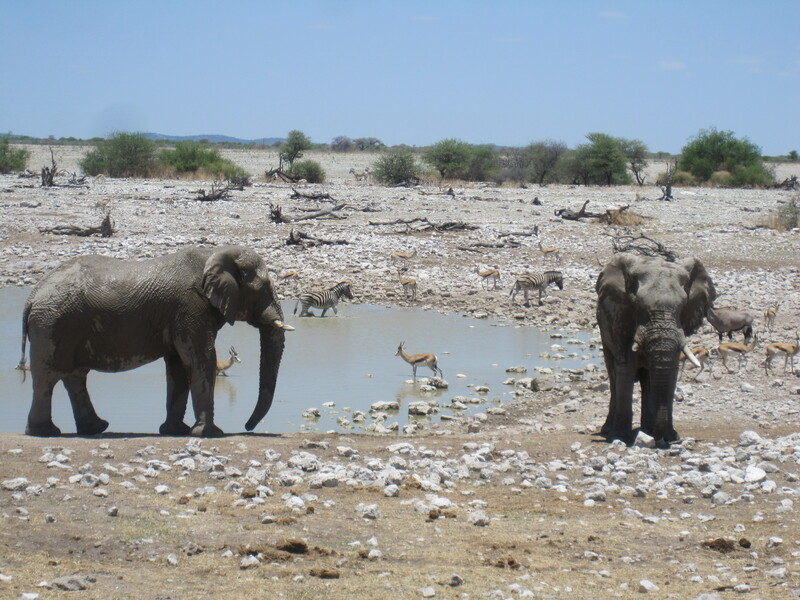 And then there was the water hole! This was out of this world amazing! It’s a floodlit water hole that is active all night long where you can sit and watch the animals in their natural habitat. They seem to have their own patterns and times that they visit the watering hole, the rhino it seems arrive at 9pm every night. We were just sitting, minding our own business, when we saw over forty zebra, elephants, oryx and springbok and of course giraffe all coming to play and drink in the time of the day when the air had started to cool just a slight bit. It was just magnificent. We watched the beautiful sunset over the African landscape amidst the smattering of animals enjoying their water and then headed back to the campsite for the barbecue. It was great! Paul bought vegetarian schnitzel for Eveline and me and there was salad, baked potato, onion, a white sauce with onion and mushies for the potato and for the meat eaters there was chicken, sausage and steak. Now, we’ve come to learn that a South African/African barbecue is called a Braai, and that’s definitely what we had! After dinner came the coffee, tea and of course marshmallows! Then we wandered back over to the water hole that was only a short distance away to find two rhinos, over 25 elephants and little baby elephants! It was without a doubt one of the most magnificent sights I’ve ever witnessed! After watching in awe for awhile where everyone sits in silence and it’s literally as if you’re watching something on telly and you can’t possibly imagine that it’s right in front of your eyes until you hear the animals call to each other or feel the droplets of water as the elephants splash around, we headed back to the campsite to hang out for a bit and then wash up. We had taken our malaria pills in the morning and sprayed our tents in the evening and just hoped for the best about the little mossies that could carry the big diseases would stay away from us. We went to sleep knowing that the black-backed jackal had hopped the fence and was roaming around the camp sight -and might wander away with your shoes if you left them outside your tents for the night. Tomorrow: Game Drives and more animals! We awoke this morning to a brand new day that started again with oatmeal and peanut butter and some tea for me and coffee for the husband. We headed out for a bit of a drive and I slept most of the way-I know, so unexpected, right? We stopped at Spitzkopope which is the tallest peak in Namibia for a quick photo stop (and a smoke for Paul) and then headed for a roadside market. This was a small market set up by the Nama tribal people to sell all different types of quartz and crystals and again the little children came running right up to us with no regard for strangers. They smiled for the photos and were busy playing with the simplest of things, rocks, sand and sticks… having fun and making the materialism of the west look so unnecessary for toys…although you could see that they were wanting for both food and clothes. We wandered the market and looked at all of the glittering crystal of different colors, shapes and sizes. After much decision making we bought two small pieces, one purple and one black for later use. After the crystal shopping, back in the van one more time to the supermarket for a lunch stop and then to the lodge in Otijwarango (which means a beautiful place/home of the fat cattle). This lodge was on a game reserve and they have ostrich, flamingo, kudu, wildabeast, impala, springbok, oryx, zebras and giraffes. We dropped our stuff in the beautiful room and went on the walking trail on a hunt for animals and were careful to watch for snakes both in front of us and in the trees above. And then, there it was…one minute it was a tree, and the next we saw it…a giant giraffe just lumbering through on its way from nowhere to no place and it was beautiful. What an amazing sight…I felt like we were literally on the discovery channel or in an episode of national geographic..it was amazing! We saw wildabeasts (and heard them…they are a flatchilant bunch), and tons of springbok and then out of nowhere we were in a standoff with two zebra; one in front of us and one behind both close enough to touch. It was unbelievable…I think I held my breath for a good five minutes as we all stared at each other waiting of course for the zebra to decide where to go and hopefully that didn’t mean charging directly at us. Well, we survived and will never quite forget that moment in time and headed back for some rest at the pool, but Mathew hadn’t had enough and headed back out for a wander again with Daniel and David. I watched the ostrich and the flamingo family by the pool and the carroways just outside our terrace and after watching the sunset we went off to dinner at the lodge with everyone. After another amazing day and another amazing sunset we spent some time on the internet and working on the blog and are now getting ready for a new adventure tomorrow where there will be an abundance of wildlife for many real life safari adventures…what an unbelievable experience this is. Real life animals close enough to touch, see, smell and just sit in wonder of their lives. I am so glad we are doing this…I already can’t wait to do it again! 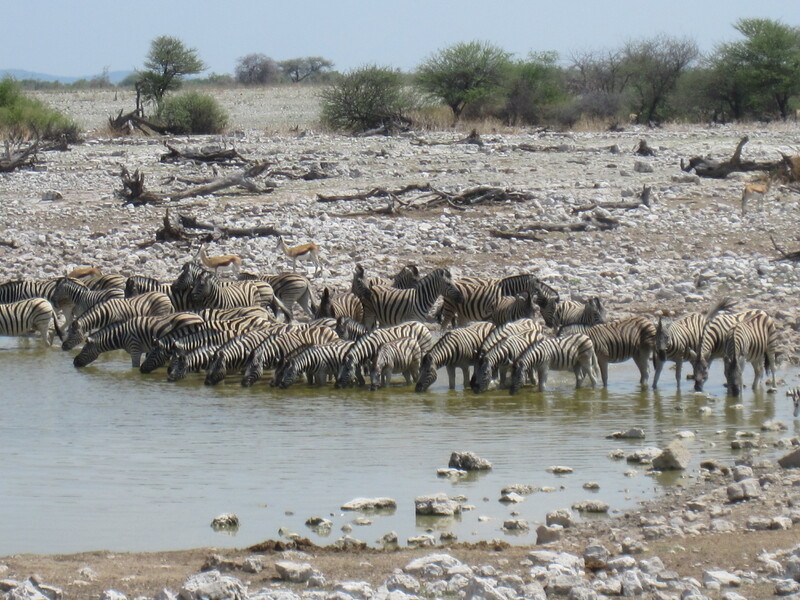 Tomorrow: more animals at Etosha National Park. We woke up this morning and as breakfast was not included we once again got to have our favorite on the road brekky of oatmeal and peanut butter and a cup of tea…thankfully this room also has a kettle which was awesome! We finished our breakfast and got ready for the day. We got our laundry together as this lodge had washing service for 60 rand per basket (that’s about 10 bucks) and we dropped off our clothes and headed out for a little bit of internet time down the road as we had to be ready for our 10am pickup for the Township Tour. Castro picked us up at 10 and we drove for about ten minutes from Swakopmund to this Township. It was so unbelievable to think that just on the other side of this resort town with expensive hideaways and seaside prices is this area of such poverty. Now, if you don’t know, the Township is where during the South African rule of Apartheid all of the blacks were placed. Now Castro explained to us that the reason that we were seeing different types of housing was because the government at the time built different types of housing for different tribes in order to create disunity amongst the people and try to foster some resentment in the township itself. There were some houses on the edge with full electricity and running water and a roof and siding that would keep out the elements and then there was the other spectrum; houses held together by rubbish tins and boards of timber with no electricity, no running water and absolutely no protection from the elements at all. As soon as we arrived and got out of the car we were met by a few little children (without shoes) who came running straight towards us to be picked up and played with without a care in the world. They were adorable. I was asking as to why they weren’t in school and Castro said that they start school at the age of six but also that there is an AM and a PM session at the school since it’s not large enough to hold the children as there are too many children in the township to be accommodated in just one session. One little girl took to our hands and pleaded with us to lift her up and flip her as so many young children do and of course we accommodated her wishes. Others came straight up to me and loved my hair and wanted to hold my hand while a little boy of about ten ran right to Mathew and grabbed his hand instantly. And then they saw the camera. The deal was that you were able to photograph children under the age of fifteen but any older we had to ask permission. The amazing thing was how much the children wanted their picture taken and how much they wanted to see it once the photo was captured. Castro told us that very few people in the township have any access to cameras and so the photos taken by travelers are often the only ones they ever see of themselves. We took many and asked for the address to send them to as we promised them copies upon our return home, it was the least we could do for such welcoming hospitality. After many photos and hugs we said goodbye to our little friendly friends, went to a small craft market in someone’s home and then headed to the home of Momma Lena, an 84 year old woman who was the chief of the Damara tribe and an elder in her church. She welcomed us into her small home and shared some stories about life under South African apartheid rule as well as the German rule of Namibia. She spoke in the click language (but was able to understand English) and Castro translated for us. She explained that she had been a nanny for a German family in Namibia for 43 years and they were the ones who kindly helped her to expand her home to accommodate her daughter, son in law and three granddaughters. (The entire home with expansion was no bigger than half the size of my house growing up) It was just incredible to be in the presence of such a wise woman who held so much significance with her people. She was incredible, and at 84 had such a vitality about her that showed she had so much left to do in this world. As we left the home of Lena we made sure to do the handshake on the way out; as you do a triple handshake on the way in and only one on the way out. We then headed over to a third grade class at the township primary school. The moment we walked in the children, dressed in their uniforms-some without any shoes, burst into song in English and continued to be incredibly sweet and polite. We spoke with their teacher and then proceeded to let the children ask us some questions. We were told that they receive their instruction in English because there are many tribes in one classroom and if and when all students come to school they could have as many as 45 children at once. There were kids without shoes and the walls were barren, completely unlike any elementary school that I’ve ever seen. Castro explained to us that by a young age these children already know as many as four languages; their own tribal one, one of perhaps their close friends, English that they are taught in and Africanz as well. We listened as they sang, took pictures of their smiling faces, marveled at their well-behaved demeanor and answered their questions as they so politely answered ours. They wanted to know the animals that America had as they knew that Australia had a kangaroo. They wanted to know what students in my school were like as I told them I was a teacher, too. We made sure to say our goodbyes and get the address of the school from the principal to send them their photos and perhaps some extra supplies that they were in desperate need of from the looks of things. From the school we went for a drive through the poorest end of the township where there is no water or electricity in the houses and many are made from refuse and timber. There are water well-like taps that are available in certain places and are shared and there are shared makeshift showers that are outside and not fully well enclosed at all. People make small fires in outside barbecue pits for light but there is such a danger with the winds that the sparks could not only catch fire but literally burn entire homes and areas. We went to the home of a medicine woman who showed us many herbs/plants she uses to help people or to heal them from ailments such as asthma or the flu to larger situations as diabetes and pregnancy. It was awesome! Castro also translated as she understood English but spoke in the click language like Momma Lena did. Castro and the son of the medicine woman tried to teach us the clicks and how there are four distinct clicks and how it completely changes the meaning of the word just by the click that you place in front. For example, you use the same word for love and for kill but the only thing that makes the determination is the correct click before the word. Anyway, we didn’t eat much but were appreciative of the effort and the experience to be in the typical setting and see the typical food. That was our last stop and Castro then drove us back to the hotel. We thanked him profusely as that tour was an experience different to any other either of us have ever had and we were so glad that we did it. We stopped in our room for a second to find all of our laundry done and nicely folded in a basket which was lovely. We headed into town for some lunch at a café and did a quick walkabout back at the craft market since we were really looking forward to purchasing a giraffe but were concerned with carrying it for the duration of the trip and how much room there was on the coach. We wandered a bit, Mathew went to look at a rugby shop and then met me at the internet café where we stayed until dinner. After showers we went to dinner with the whole group at Kuckis (pronounced cookies)- which in German means small chicken, had a nice dinner and then went back for a sleep. Tomorrow: the possibility of GIRAFFES!!!!! We woke up to a beautiful sunrise over the mountains from our triple luxury room. We packed our bags, said goodbye to this lovely room, played with the dogs, had some breakfast and jumped in the van for our next adventure. We drove on what seemed to be the most dirt and rocks we had ever been on-the road was endless. Our first stop was at a town called Solitaire for supposedly the best apple streudel in all of Namibia. This bakery, run by a man named Moose Macgregor (cousins of Ewan Macgregor) is known on a national and international level and boy were those streudel a hit with everyone who had one. After that stop we had a few more scenic photo stops of mountains and landscape and one was thriving with quartz on the ground. We finally reached a tar road which was a welcome surprise and made our way to Walvis Bay on the Atlantic Ocean. This little seaside town is just on the outskirts of Swakopmund, Namibia known for being the adventure capital and a favorite of Angelina Jolie and Brad Pitt. They visit these two places a lot and just in between Walvis Bay and Swakopmund is where they stayed when she came to give birth. When we pulled up to Walvis Bay, you’ll never believe it, but, we were met by about 50 flamingoes just hanging on their one-legged perch as if they were waiting for us to arrive. They looked whiter than the ones you see in Florida, too. It was amazing to just see them standing there hanging out enjoying their one legged standing lives. After enjoying the time with the flamingoes and jumping my feet into Walvis Bay and it’s squishy mud by the banks of sand & we headed to the Desert Explorer to watch a video of all of their dare-devilish activity that you could book for the next two days. They had sand boarding and skydiving and quad-bike riding (a favorite of Angelina’s kid Maddox apparently) and many other things.